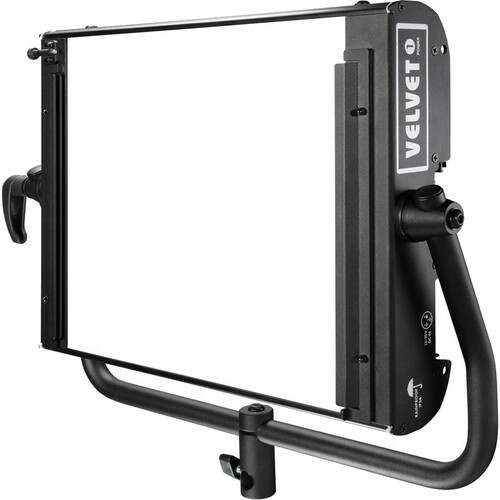 The VELVET Power 1 Flood Bi-Color LED Panel with Yoke from VELVETlight is a light source with an expansive 2700 to 6500K variable color range and a high CRI/TLCI rating of 95, indicating an accurate rendering of color. Light intensity is also variable from 0-100% with flicker-free performance at over 1000 frames per second. Both functions can be controlled locally on the fixture or remotely from a console via onboard DMX. The sturdy aluminum fixture has a compact form factor with an illuminated surface measuring 15 x 12" and has negligible generated heat, making it a wise choice for placement in relatively tight spaces or for use close up to the talent without causing discomfort, while its 30-degree beam angle makes it an asset for long-throw use or selective lighting. A special feature of the VELVET Power 1 is its IP54 weatherproof rating making ideal for shooting outdoors in rainy or inclement conditions. The Power 1 Flood ships without a power supply. Separate purchase of a 90-260 VAC power supply or a V-mount or Gold mount battery plate is required for use. The fixture's tight 30-degree beam angle makes it an asset for long-throw use or selective lighting. With the VELVET Power 1 there is no need to use correction gels or replace diffusers to vary color temperature and light intensity. The soft beam produces open shadows and is easy on the talent's eyes. The light goes beyond the 3200-5600K of most bi-color lights and offers a wide 2700-6500K color range. The 3200/5600K quick-shift button gets you in the often-used color temperature range fast. Constructed from shock-resistant aluminum, the panel is also rainproof for use in inclement weather. A power supply must be purchased separately. The Power 1 has none of the possible vulnerabilities of fan-based cooling. The VELVET's heat-dissipating structure gives the LED diodes a 50,000-hour lifespan and is completely silent, a valuable asset in sound-sensitive environments. The concentrated output is powerful enough to be bounced, shaped, or softened with traditional grip, VELVET hard diffusion, or foldable Snapgrids and Snapbags.